NOTE: This information is good as of 5/25/2015 and is subject to change! We will continue to see issues relating to getting into the Power BI Admin Center. I’ve covered some of the issues we see that relate to this. These discussions are usually the same, so I wanted to share what is required to get into the Admin Center. I also wanted to share what is not required. The account trying to get access to the Power BI Admin Center needs to have a license for Microsoft Power BI for Office 365. The Office 365 bit here is important as this is the license for the existing service today. Power BI Admin Center is tied to the existing service. Going back to the Microsoft Power BI for Office 365 license, what is really validated is the Microsoft Power BI Information Services Plan 1 component of the overall license. That needs to be checked. Within the Power BI Admin Center, you will see a section called Role Management. 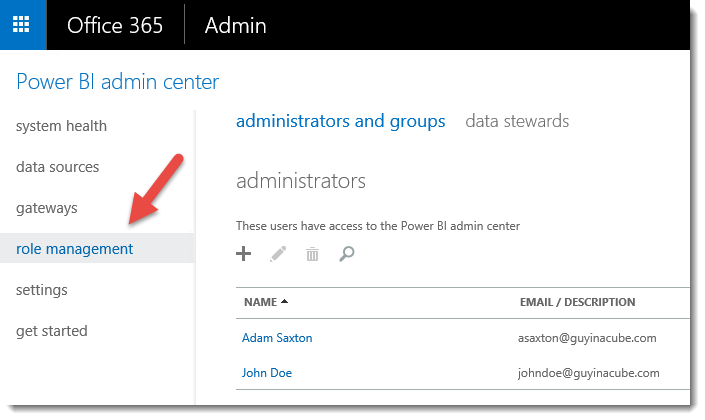 A user must be listed here in order to get into the Power BI Admin Center. The only user listed here by default is the user that created the Microsoft Power BI for Office 365 subscription. That user will need to go in and add other users if they need other people to get in. You can accidently block yourself from the admin center if the user listed here doesn’t have a Microsoft Power BI for Office 365 license assigned, or that user is deleted. There is no real recovery mechanism today outside of calling support and we can manually add someone into this role in the backend. We do see calls on this, hence why I’m mentioning it. If you are in a situation where you only have 1 license, you may need to swap it around to get the right user listed in the Role Management. I talk more about the Role assignment and the fact that you can block yourself out more in this link. If the license only says Microsoft Power BI, then this will not get you into the Power BI Admin Center. The Microsoft Power BI license is for the Public Preview. 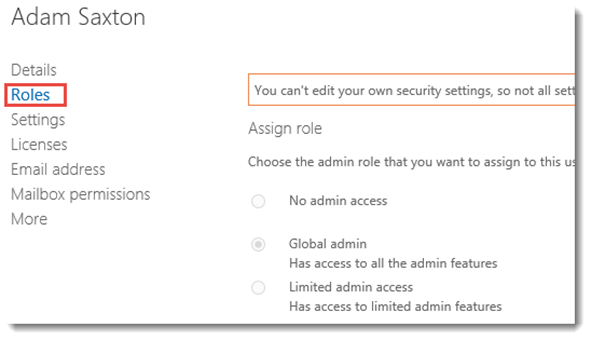 The Office 365 Roles that you have assigned to a specific user has no bearing on whether you can get into the Power BI Admin Center. For example, my account is listed as an Office 365 Global Admin. This does nothing for me, currently, with regards to getting into the Power BI Admin Center. It just isn’t checked today. 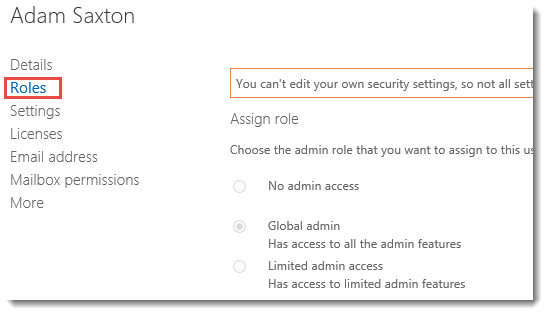 The Office 365 Global Admin Role is not required! 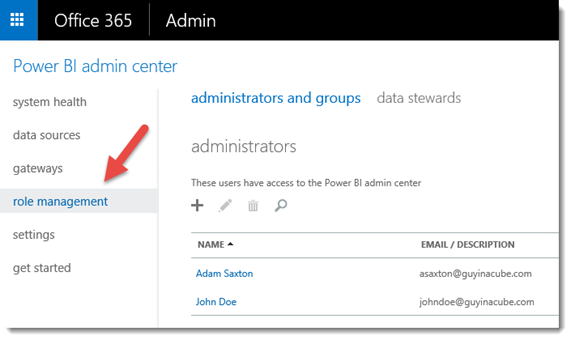 Having No admin access selected is just fine with regards to the Power BI Admin Center.